Once you obtain a fairy or two, imagination sets in. You start to think, they need a chair or a bench. You want them to have a fairy house. In my perfect fairy-land, they needed fire and water elements. I cut the popsicle sticks with side cutters and sanded them to make the pickets. I painted them with white out as I wanted the fence to look weathered. I used floral wire to connect the pickets. The moss came from the roof of my garage and the neighbor's shed. 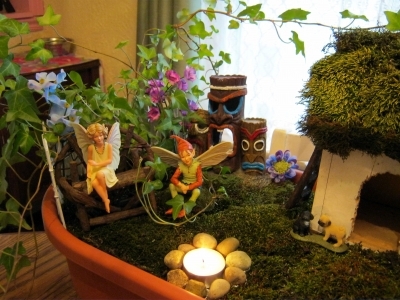 Creating a fairy garden: could you provide more details? Your garden is really beautiful but I would love to know much more about it. 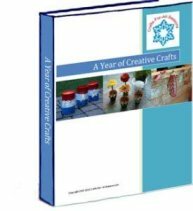 Any tips on getting started so I can make my own? 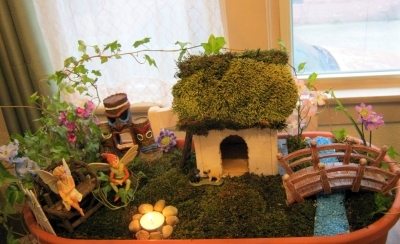 Kindly let me know where you got the little fairies and which material you used to make the fairy doors and other things. Thank you in advance! Hi. You can get nice fairies at Amazon.com. 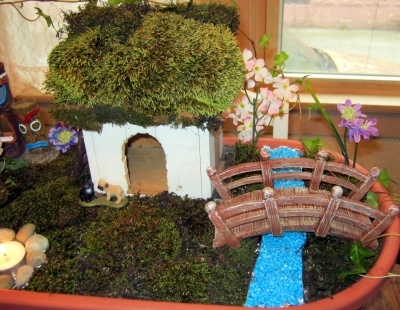 That is also where I got the planter, the bench, and the little bridge. The 'water' is blue aquarium gravel, which I poured clear nail polish on to keep it in place. On the birdhouse, I turned it sideways and drilled holes in the shape of the door, then hit it with a hammer to get it out, then sanded the edges. There is regular potting soil in the whole thing, and that is an ivy plant on the left. I use a tea candle surrounded by small rocks for their fire pit. Any other questions, just ask.